Festival Season again in Europe: Nimrod Ron (Principal Tuba - Iceland Symphony Orchestra) is currently on tour with the West-Eastern Divan Orchestra under Daniel Barenboim and visited Melton/Meinl-Weston in Geretsried together with Jaume Gavilan (Solo trombone) and Yuval Wolfson (Bass trombone) on August 9th to pick up a BBb-Tuba for the upcoming concerts in Salzburg, Berlin, Luzern und London. Maestro Barenboim recommended a BBb-Tuba to be used, especially for Wagner. Product Manager Martin Matthies didn't hesitate to provide Nimrod Ron with a selection of BBb-Tubas to chose from. Now a Meinl-Weston 195/5-P "Fafner" BBb-Tuba is proudly joining the Europe tour - and it even gets its own seat on the airplane! 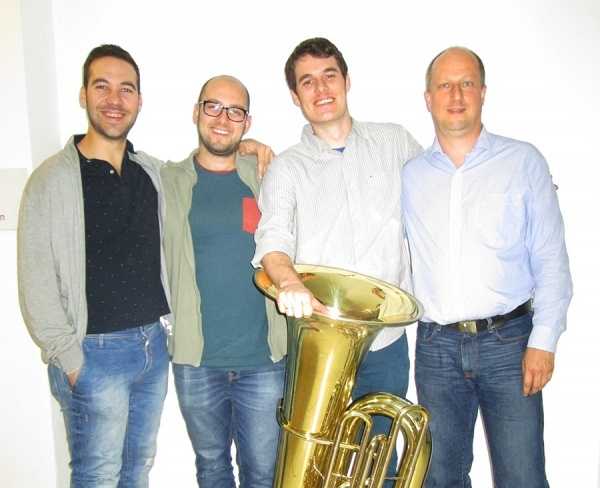 Picture: Trombone Colleagues Jaume Gavilan und Yuval Wolfson helped Nimrod Ron to select his preferred BBb-Tuba and at the same time checked the B&S "Meistersinger" and Courtois Trombone models and Meinl-Weston Basstrumpets.